A track day is a non-competitive event allowing riders of road and track bikes to come to a race circuit and explore their bike's performance in a safe, controlled and professional environment. You don't need a performance bike to take part as MSVT has track days suitable for all abilities. 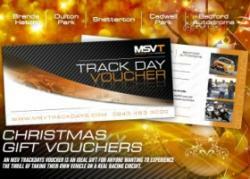 Track day vouchers come in a gift pack and start from just £50. All vouchers are an amount in credit that can be used towards the cost of ANY MSV Trackdays event or product in the next 12 months. When you order a trackday voucher from MSV Trackdays you will receive a gift pack that explains everything you need to redeem a voucher and to book your track day. All voucher packs are despatched via the Royal Mail postal service and are subject to a delivery fee.